I have heard it suggested by the occasional visitor to this blog that it does not portray an entirely accurate picture of the household in Birkenhead. Where are the children who would rather sing and dance than lay the kitchen table for supper? Where are the raised voices and the shouts of dissent? Does it ever rain in the garden? Well it rained in the garden yesterday afternoon. It started just as I thought I had half an hour to plant some seeds in the vegetable plot. So there was a quick five minutes pulling the washing from the line. I convinced myself that it was only a fine drizzle but by the time I got back outside it had settled down into a fine heavy rain so I had to go back into the house to find a waterproof jacket. As I bent over the soil to fork out a shallow trench in the soil to lay the seeds in the rain collected down the back of my neck and ran down to soak my trousers. Back inside it was late afternoon and the kids were finishing off homework and wanting to print it off for the next day. There was a loud wail as one of them realised that the printer was out of ink. The was just enough time to squeeze down to PC World to spend £25.00 I was not expecting to spend on two new cartridges. At home the dishwasher was still not working so before starting on dinner there was another round of washing up to be done. I started to fill the sink and reached for the washing up liquid on the shelf underneath and realised the shelf was covered in water and it was spewing down from where the plug should have been holding it in. I then noticed that a piece of metal round the plug in the small second sink was loose. I was able to unscrew it and found underneath a layer of black gunk that looked like it had been accumulating over the last five years. It was like a picture from a newspaper expose into the kitchen of a dodgy backstreet takeaway. There was nothing for it but to get my fingers stuck in to clear it out. Rather to my surprise once the gunk was removed and the pieces of metal screwed tightly back in the sink worked and the leak had gone. We finished off lasts night’s late lunch for supper this evening eating up the chicken with forkfuls of giant couscous. Whilst making a vain attempt to clear some space on a shelf I had come across a Kilner jar of sun dried tomatoes in olive oil. I am fairly sure the tomatoes were bought about seven years ago when we went to Verona for a week. They were black in the oil and tasted old and intense. 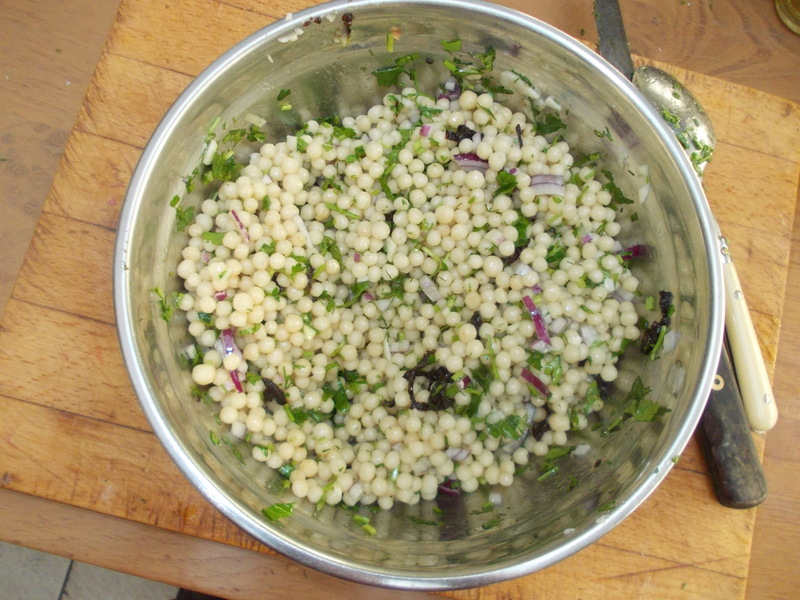 I chopped a few of them up to mix into the couscous along with half a red onion, garlic, parsley and dill. Now watch this to see how to make a frittata. 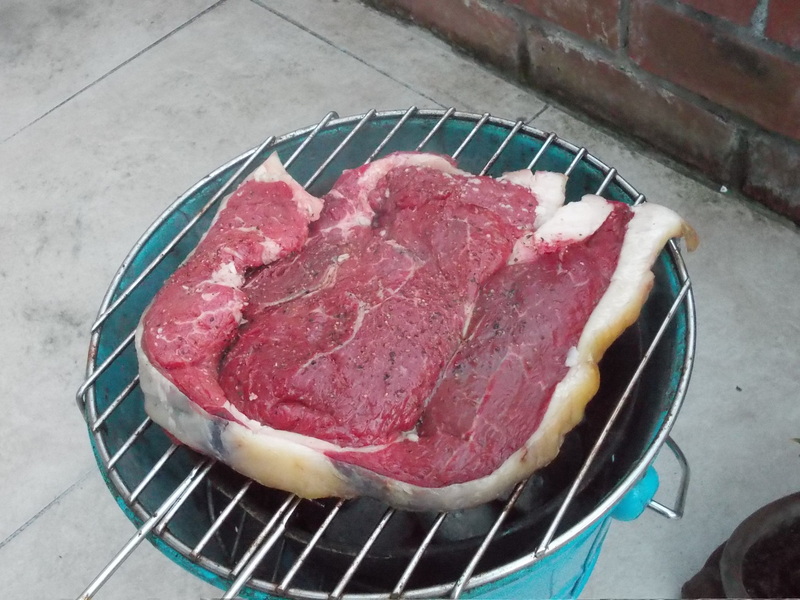 Last night we had a great hunk of rump steak cooked whole on the barbecue so it was was charred on the outside and pink in the middle. Yesterday at the grocers Kazim suggested that I should buy some of their broad beans. They were very young, young enough not to have developed a tough skin and he told me I should have them with a dressing of olive oil and lemon juice and some dill too. We had them as part of a late lunch this afternoon together with a salad that I had eaten in Barrafina earlier in the week; radish, fennel and pomegranate seeds. There was also a large plate of chicken cooked with ground cumin and two aubergines, cut in half, salted and then fried slowly until soft and then slathered in a dressing of olive oil, lemon juice and lots of garlic. There was more garlic with the chicken. The grocers have been selling bulbs of young garlic from Egypt and I tucked a couple into the chicken pieces as they roasted. By the time the chicken was done the garlic was soft so you could squeeze it like tooth paste out of its papery skin. The day has been bright, cold and sunny. In the right angle and out of any wind there was some heat in the sun but where there was any breeze the heat was replaced with a chill air. The rest of the afternoon was spent in the garden. Half an hour pulling at weeds and trying to gain some control over the ground elder that seems to grown in every bed twisting its way up the roots of what ever is in there. The tomatoes and chillies are starting to shoot in the greenhouse. So maybe I will do better than last year and there will be a crop we can actually eat. The rest of the time was spent potting dahlias. I’d dug all the tubers out of the ground late last year in October and since then they have been on an old orange Sayer’s the Bakers tray in the greenhouse with their soil. With the promise of heat in the sun it seemed like a good day get them out again. Some of the tubers had gone soft in the winter cold but most of them were still firm. I shook off their dry earth and put them in pots with new clean damp soil dug out from the depths of the compost heap. It is good to think of those dried husks slowly taking on life over the course of the next few weeks as the gathering warmth and damp soil works on them. I fell asleep for twenty minutes face to the late afternoon sun listening to James Yorkston having been to see him last night. He had played with The Pictish Trail and Seamus Fogerty each taking turns to play a song, swapping harmonies and instruments. Today I started at The International Store to buy eight lamb chops, four long mild green chillies and a bag of peppercorns. Peppercorns are one of those things. As you get to the end of the packet you make a mental note to get some more but always forget and you then find yourself with no grinds left. I remembered this morning and there is enough in the cupboard for another month or so. It was then up Oxton Road to the grocers were I bought more than I meant to. I got talking to to Kazim and he told me that he had been making quince jam flavoured with rose petals brought back from Iran. He then recommended the broad beans and suggested they would be good raw just flavoured with some olive oil and lemon juice. He told me that he had a surfeit of mangos and I promised to look out a recipe for mango jam. 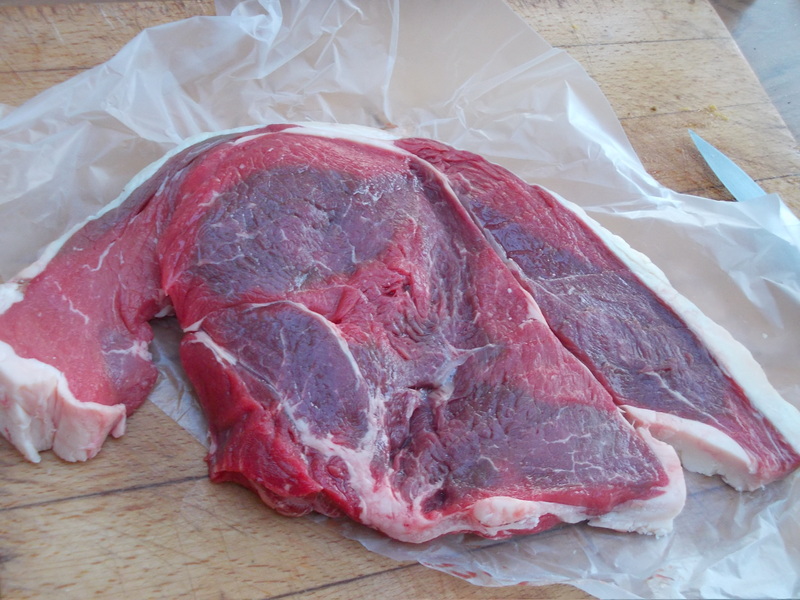 It was then on to Edge & Son for a large piece of rump steak for tonight. If it stays dry I might even do it in the barbecue. I had the lamb chops for lunch. I put a ridged grill pan on a full heat and allowed it to get very hot. Whilst that was heating I crushed a good pinch or two of cumin with just the one pinch of se salt. 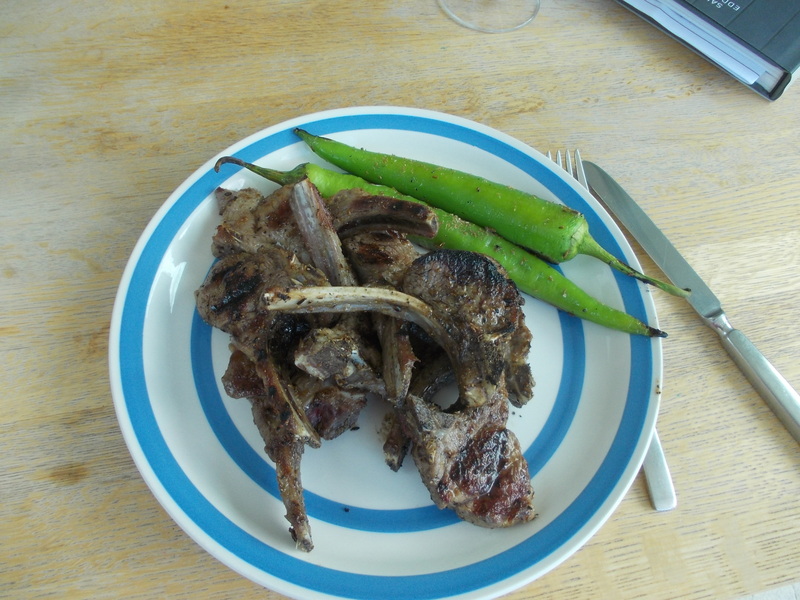 The lamb chops were then put in a bowl for some olive oil and swirled round so they were greased up. About half of the cumin/salt mix was stirred in and they then had a good few grindings of black pepper. By this time the grill pan was smoking so I threw the lamb chops on. They spat and billows of smoke swirled around the kitchen. 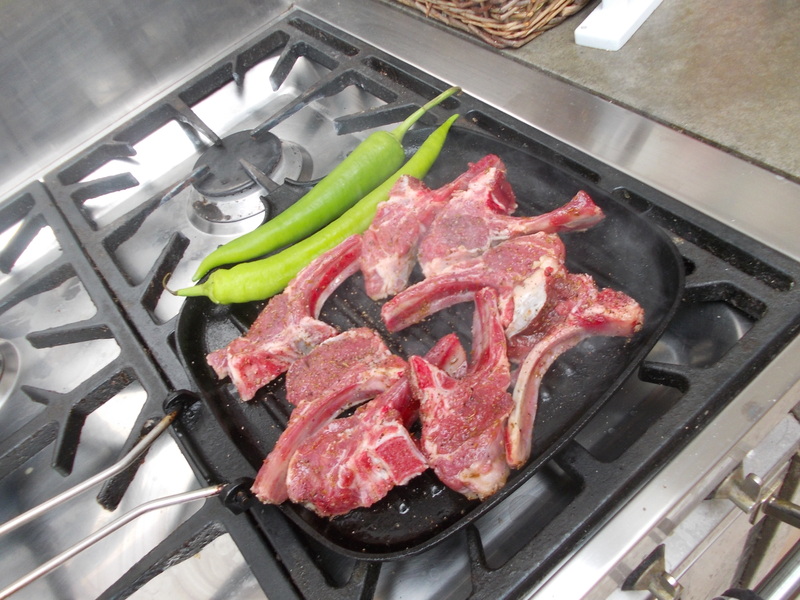 As I turned the chops I put two of the green chillies onto the grill to heat through. One of the best lunches I have had for a while.